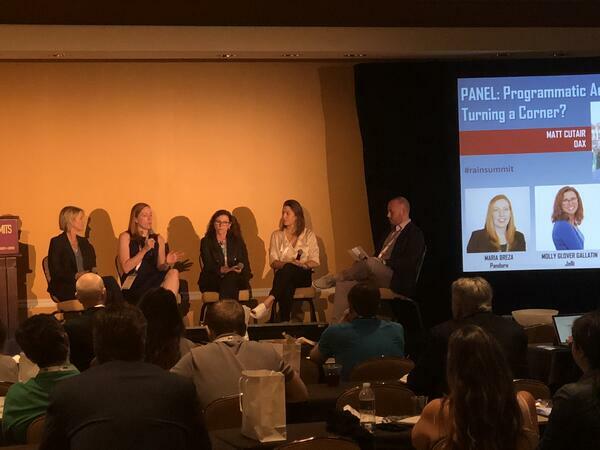 The panel I participated on "Programmatic Audio in 2018: Turning a Corner?" focused on how programmatic advertising is illuminating the central role of data in audio, driving more intelligent audience targeting, media planning, buying, and attribution. Joining me on the panel were representatives from Pandora, Rubicon Project, and Wide Orbit. The panel's focus coincided perfectly with our partnership announcement with Foursquare and iHeartMedia about bringing attribution to advertisers who buy radio via SpotPlan, our demand-side platform. Data was a key topic throughout the conference as radio starts adopting capabilities that "digital" are known for, such as audience targeting and real-time analytics. There was a lot of buzz around podcasting and its growth at the show. According to Edison Research, 17% of Americans now listen to a podcast each week, up from 7% in 2013. An interesting chart was shared during the RAIN Summit by Kurt Hanson, Founder and Publisher of RAIN News, highlighting how podcasting's growth is in line with what was seen in streaming exactly nine years prior, alluding to the same growth trajectory. Another key theme that was reiterated throughout the show was the importance of thinking beyond programming for AM/FM and that stations need to recalibrate and focus on the fact that they are in the "audio" business now versus the "radio" business. Listeners are less tied to the station and more loyal to the content it creates, like their favorite morning show, so podcasts are not only a great extension of the station's brand, but with the ability to cross-promote, a powerful combination! generation z doesn't think about radio! We all know that audiences are changing with the growth in audio formats and devices - from streaming and podcasts to connected devices and the connected car. And, although radio is still the dominant way people consume audio, reaching 93% of the population on a monthly basis, based on the panel I saw of students from the University of Central Florida, Generation Z thinks about "radio" in a totally different way. When asked if they listened to radio in the car, the answer was a universal "no." "Too complicated to program the car radio," which made the audience laugh, but it drove home an important point - digital natives approach audio and entertainment differently. So, how are they listening? Predominantly via their mobile device. And, what are they listening to? Apps like Spotify, Tidal, Apple Music, and SoundCloud. Unless they want to see videos or concerts and then they go to YouTube. Asked how they get their news? All answered "Twitter." So, this was a sample size of four students from one University, so not exactly statistically significant, but it was compelling to hear first-hand. Overall, it was a great few days, soaking in great panels and discussions around how radio is transforming and the exciting opportunities that lie ahead. I think Bob Pittman of iHeartMedia said it best during the Radio Show opener, "Audio is Hot!" 15-Second Radio Ads Are Here!